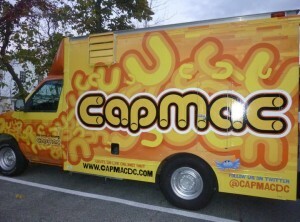 CapMac – Washington, DC – Capital of Macaroni (@capmacdc) – Food Truck Talk – Searching for the best foodtrucks! The CapMac food truck is located in our nation’s capital, and they have quickly become one of Washington, DC’s most popular food trucks. True to their slogan, CapMac is “the capital of macaroni”. They have earned this title by serving up some of America’s favorite pasta dishes, often with a new twist. Washingtonians crave Capmac’s Macaroni & Cheese not because it tasted like the stuff out of the box you got when you are a kid, but because it doesn’t. The freshly made CapMacNCheese elbow macaroni is smoothered in a Cheddar cheese sauce with pimentos and Cheez-It crackers! The pimentos are a nice addition as they add a little complexity and “grown-up” taste to the dish. The addition of the Cheez-It cracker crumbles is sheer brilliance as it adds not only texture but additional cheese taste. CapMac also serves other macaroni specialties including Chicken Parmesan Meatballs over rigatoni and Beef Bolognese over rigatoni. I prefer rigatoni and other short pastas as they are easier to eat, especially if you intend to keep your shirt clean! 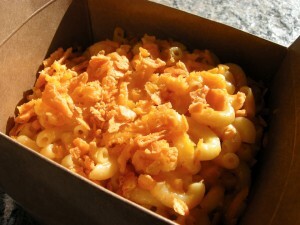 CapMac offers other MacNCheese mix-ins and combinations that alternate through the week. They also offer soups that regulars seem to really enjoy! Portions are very large, and the pasta dishes are served in large cardboard containers. CapMac is off to a fast start and I imagine they will offer a wider variety of comfort food choices in the weeks to come. Washington, DC is lucky to have CapMac, they serve up food to give you that warm and fuzzy feeling.